"I hear you bought yourself a haunted house." The Amityville horror house is considered to be one of the most frightening haunted houses in New York. While there are millions of rumored haunted places in New York, this particular house stands above the rest because of the tragedies that have taken place in and around the structure. Located on Ocean Avenue at the numeric address of 112, this sinister Amityville home in the State of New York still instills a high level of fear and curiosity from individuals as well as the media. This mostly stems from the grisly murders that took place in the home on the 14th day of November in the year of 1974. This is when a twenty three year old man by the name of Ronald DeFeo murdered his parents, as well as four siblings that were younger than him. However, the true mystery of the Amityville horror house started when a couple by the names of George and Kathy Lutz moved into the seemingly beautiful structure in the upscale neighborhood. During the year of 1975 a man named George Lutz and his wife, Kathleen – “Kathy” for short – set out to search for a home. They wanted a permanent residence that they could raise their family in. For several months, they visited many homes that were on the real estate market. Unfortunately, nothing struck them as particularly appealing for the goals that they had in mind. There were quite a few possibilities, but they felt as if none of the homes classified as their “dream home”. Finally, the air warmed up a bit and summer came into season. The couple and their children continued to search for an ideal location. Eventually, a realtor took them to a house that was three stories in height and reflected the beautiful architecture of the Dutch. Unfortunately, the structure proved to be nothing short of a nightmare for the family. The couple recalled that when the realtor showed them the home that she reminded them of the murders that had taken place in the structure. Immediately, this sparked the interest of the couple as they tried to recall the case that the realtor mentioned – “The DeFeo Murders”. When she realized that the couple could not remember the details associated with the case, she reminded the couple on the events that had transpired in the year of 1974. 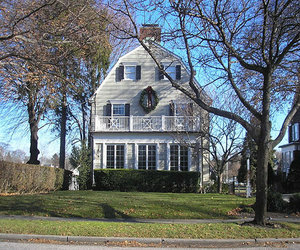 Despite the fact that the Amityville horror house was considered to have a veil of evil surrounding it at the time, it was not yet considered to be one of the haunted places in New York. Despite the atrocious crime that had taken place in the home, the couple and their children decided that this would be their home. The purchase of the Amityville horror house was made, but little did the family know that they were about to move in what would be considered one of the most haunted houses in New York. Since the famous DeFeo murders had taken place only thirteen short months before the Lutz family moved into the Amityville house on Ocean Avenue, one of George’s friends suggested that they have a blessing from a Catholic priest beforehand. The name of the priest was Father Mancusco. He actually performed the blessing the same day that the family was moving their belongings into the home. When the priest entered the main bedroom of the home – he claimed that something very unusual happened. He apparently heard a man yell, “Get Out!” Based on this experience, he informed the Lutz family that the room should not be used to sleep in, but neglected to tell them of his personal experience in the room. Unfortunately, despite the good intentions and experience of Father Mancusco, the blessing did not work for the Lutz family. It seemed that the sinister spirits of the Amityville horror house were simply too strong. Immediately after moving into the Amityville horror house, the Lutz family started experiencing many unexplained situations. First, they were overwhelmed with sensations that were ominous in nature. It did not take too long before the personalities of those in the family started to take a turn for the worse. The children started to act out in tremendous ways. They no longer behaved as they once had and fought amongst themselves continuously. George and Kathy had always been known as being good parents, often refraining from corporal punishment with the children. However, there was an incident in which they were reported to have beaten their children relentlessly with a spoon that was large and composed of wood as well as a heavy strap. These were only a small portion of the many mysterious happenings in the Amityville horror house. As time progressed, several unexplained smells started to occur. The family gave accounts of what appeared to be cheap and foul smelling perfume, as well as the smell of feces being emitted into the air. For an unknown reason, stains would appear on the toilet in the home that could not be removed. In addition to this, slime was reported to have been observed on the walls of the home. The family was consistently perplexed by the unexplained. Many individuals that knew of the challenges that the family faced believed it could have been the spirits of the family that was murdered in the home. This is when it became known as one of the most haunted places in New York. However, there were a few people that believed that the house was cursed and that demonic spirits were to blame for the unexplained phenomenon occurring in what is now called one of the most haunted houses in New York. The unexplained phenomenon did not stop with smells and personality changes. Eventually, the family experienced physical encounters with the entities that were in the home. Several times, Kathy Lutz was reportedly touched by something that she was unable to see. George Lutz developed an obsession with the fireplace in the Amityville horror home because of the fact that he always complained of being too cold. At night, he would consistently wake up at the exact same time every single day – 3:15 am. In an odd turn of events, the priest that performed the blessing on the home was experiencing psychological and physiological challenges. The story was featured in a book written by Jay Anson and was appropriately called “The Amityville Horror”. Many believe that the family simply found a way to cash in on the murders that took place in the home. However, the Lutz family stood by the fact that their experiences were real and not a hoax. To this day, there is still much debate about whether or not this structure is one of the most haunted houses in New York. However, one thing is for sure, the Lutz family never backed down on the apparent hauntings and forces that plagued them. They are convinced and continue trying to convince the world that the Amityville horror house is the most terrifying of all the haunted places in New York.